Syracuse, New York–based SPORTS recently completed the installation of their Runaway pavilion, a striking arrangement of wire metal meshes designed as an ode to the unique atmospheric qualities of Santa Barbara, California. In a statement, the designers explained their desire to “architecturalize the aesthetic quality of the air” in the beachside community, a shifting environmental phenomenon caused by the confluence of intense inland heat and cooler beach fog. The resulting “June gloom,” serves as the inspiration for the project. The pavilion is made up of three triangular masses constructed from rectilinear elements that can be repositioned variously. The masses—which have nested shapes scooped out from their interior volumes—seem to dematerialize in place, as their bright cyan, magenta, and yellow forms catch the passing light. The so-called “loungescape” works at a variety of scales and functions. Based on the arrangement and orientation of the forms, the pavilion can work as a simple wall used to demarcate space or as something grander, like a performance stage. The shapes can also be used as casual seating elements. 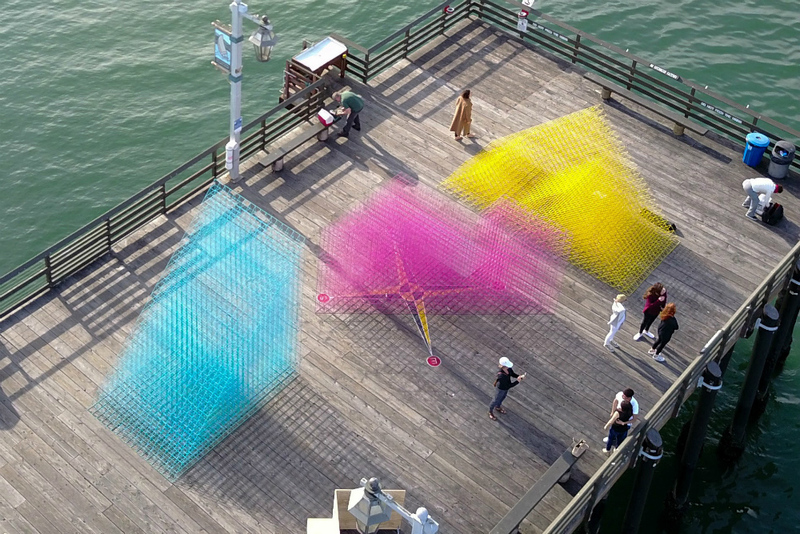 The pieces will move around the city, starting with the Santa Barbara Pier. From there, they will travel to a number of different neighborhoods and be installed in at least six sites. The composition of the project will vary according to each locale, a process the designers envision will unlock the multi-functional nature of the pieces. SPORTS completed a mint-green seating installation in Chicago’s suburbs last year. The current installation is the result of the Museum of Contemporary Art Santa Barbara’s Take Part / Make Art Pavilion competition that sought to reposition the museum as a force for urban art through traveling, neighborhood-based installations. The pavilion will move throughout the city, changing location every few weeks, through mid-August of this year. Barton Myers: Works of Architecture and Urbanism Art, Design & Architecture Museum UC Santa Barbara Santa Barbara, CA September 12 to December 12 Barton Myers: Works of Architecture and Urbanism is coming to the Art, Design & Architecture Museum at UC Santa Barbara this September. The exhibition will display several of Myers’ projects from 1968 to 2002: a span of nearly 35 years. A variety of artifacts will be on display, ranging from sketches and scale models to the architect’s lectures and writings. Myers donated the materials on display to the Art, Design & Architecture museum in 2000. Among them is information and renderings of his most renowned built work, such as the Vidal Sassoon Salon (1968), as well as his more obscure work. 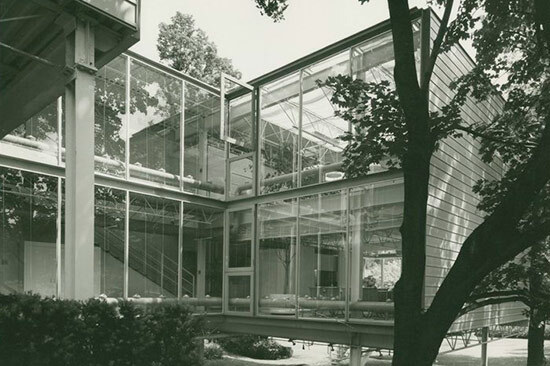 The exhibition will display Myers’ work in the 1992 U.S. Expo Pavilion in Spain as well as his famous steel houses. 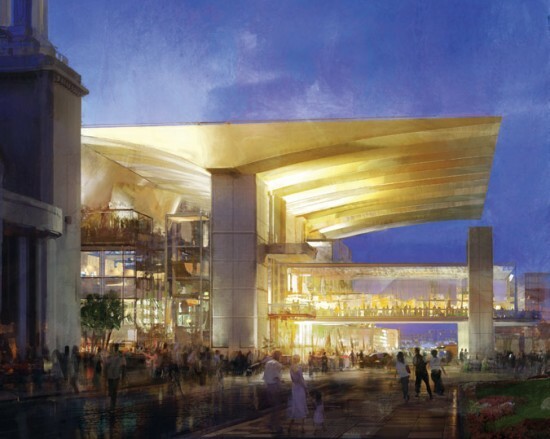 George Lucas is making architectural waves again. And it has nothing to do with a museum. In 2012 AN reported that Lucas had torn down 3389 Padaro Lane, a 1981 Modernist masterpiece on the beach by sculptor and architect Sherrill Broudy in Carpinteria, just east of Santa Barbara. Now he's finished the replacement—designed by Appleton & Associates. And let's just say it's less of a masterpiece. Featuring colonial detailing and a wrap around porch, it looks like it would be more at home on the East Coast than on the West. 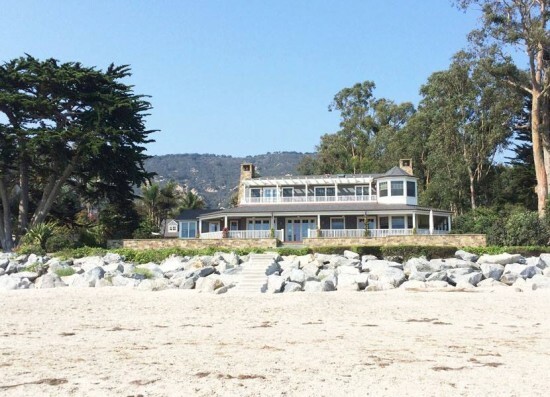 Los Angeles architect Tom Marble (who previously wrote about the house for AN) described Lucas's new abode as "Cape Cod Light, an invasive non-native systematically destroying a strain of modernism that evolved in this part of Carpenteria." Built in 1981, 3389 Padaro—known in the area as the best house on the beach—was one of just a few buildings designed by Broudy, who had initially worked as a sculptor. That background allowed him to create wood and copper detailing that gave the compound a warm, and somewhat Asian aesthetic. His excellent eye extended throughout the site, where he laid out a gym, an art studio, and a lap pool in such a way as to create a tropical oasis. Appleton has not yet posted the home to its web site, which is unusual since it's shared homes by David Zucker, Mitch Glazer, Phil Gersh, and other Hollywood A-listers. Lucas is busy talking with much more contemporary-style architects for his Chicago endeavor, including MAD and Jeanne Gang. London has Borough Market. San Francisco has the Ferry Building. Seattle has Pike Place Market. And now Santa Barbara has the Santa Barbara Public Market. 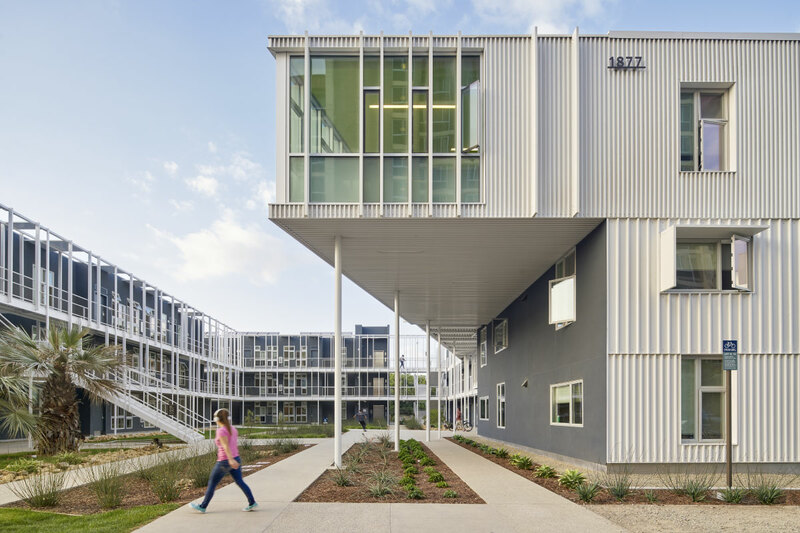 The 19,400 square-foot marketplace, put together by local architecture firms Cearnal Andrulaitis, Sutti Associates, and Sherry & Associates Architects, opened on April 14. It showcases regionally-sourced, artisanal foods in a downtown location. Part of Alma del Pueblo, a mixed-use development that includes additional retail and 37 condominiums, the Public Market is located on the site of a former Vons. “When I bought the land, I knew that I wanted to put a market back,” said developer Marge Cafarelli. “Santa Barbara . . . [has] such rich roots and traditions in agriculture, farming, food, and wine, that it made sense to put something back that made sense in this time. The Public Market is housed in an understated stucco shell, a streamlined take on the Mission Revival architecture for which the city is known. 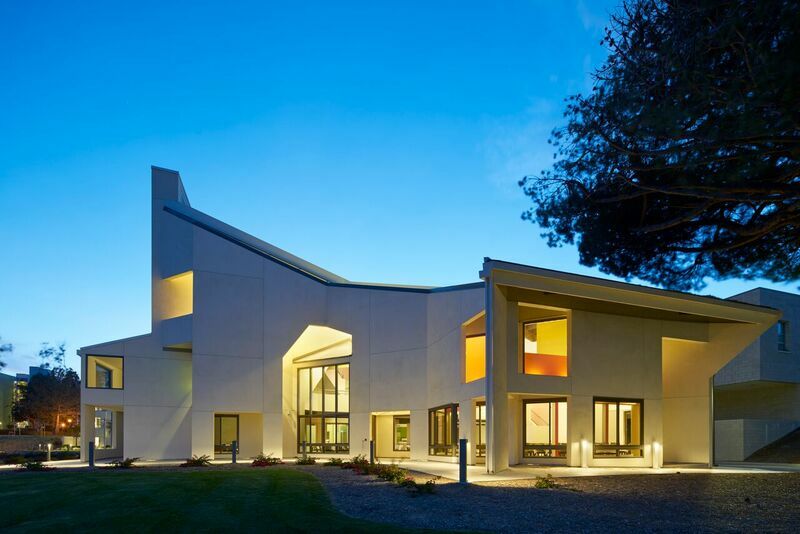 “It was very, very important to me that the building be very simple,” said Cafarelli. “Less can sometimes be more, that was very intentional.” One of the driving forces behind the design was the incorporation of an historic six-panel mosaic mural by Joseph Knowles, which the city of Santa Barbara required Cafarelli to preserve. The mural, which depicts the history of the town, had for decades fronted Victoria Street, the quieter of the two streets adjacent to the Public Market. “[We wanted] to get those panels off of Victoria Street, which will make it much more pedestrian-friendly, and move [them] to Chapala Street, which is much more vehicular oriented,” said Cearnal Andrulaitis’ Jeff Hornbuckle, project architect. Construction crews sawed the 10-ton panels out one at a time and used a crane to move them around the corner, where they were placed atop a freshly-poured concrete footing. Cearnal Andrulaitis designed the shell of the Public Market. Sutti Associates did the overall interior layout and Sherry & Associates Architects worked with the tenants—who include purveyors of coffee, juice, bread, cheese, meat, beer and wine, and gourmet groceries—on kitchen layouts. Though united by an industrial aesthetic, including a polished concrete floor and exposed ductwork, the vendor areas were given unique personalities through custom lighting and signage. Next door to the Public Market are Alma del Pueblo’s Mediterranean-style condominiums, intersected by a series of pathways, pedestrian bridges, and outdoor living rooms. The Arlington Theatre, which dates to the 1930s and features an elaborate Mission Revival facade and an art deco steeple, is adjacent to both the condos and the Public Market. 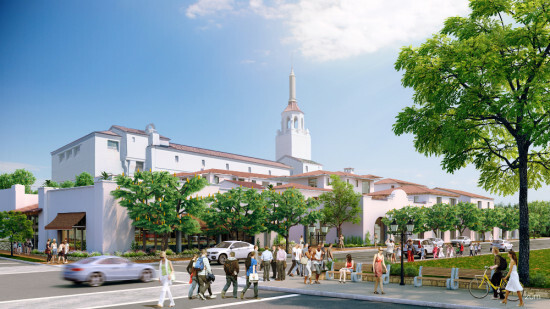 The architects opened up views to the theater, Santa Barbara’s largest, from the Victoria Street side of the complex, including at the main entrance to the condominiums. “The idea was to create a paseo that framed the view of the Arlington,” said Hornbuckle. Cafarelli is aiming for LEED for Homes Platinum on the residential portion of the project and LEED for Core and Shell Gold on the Public Market. “What was important to me was to build something that was really in the vernacular of the historic district, but to create a really high performance building in addition,” she said.